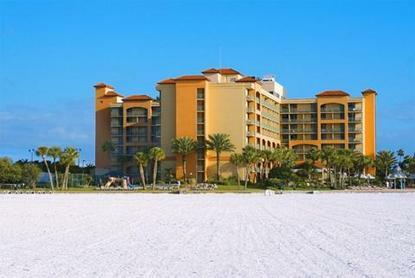 White sand beaches and the azure waters of the Gulf of Mexico greet you at the Sheraton Sand Key Resort. Set on Clearwater Beach and surrounded by gorgeous views, you feel miles away from everything, yet never more connected. Fill your days on our 10 acres of private beach, whether in a cabana, beach chair, or on a WaveRunner. Work up a sweat at the Suncoast Fitness Center or grab a friend and play a few games of tennis at our renowned tennis complex. Satisfy your need for adventure and let our concierge arrange an afternoon of scuba diving, parasailing, or jet skiing.Bring everyone together for good food and great conversation at Rusty Bistro. For casual and fun dining and a great hamburger, the Island Grille is the perfect stop for the whole family. Enjoy a little late-night bonding at the Mainstay Tavern, where the laughter lingers late into the night.When it comes to planning a convention, conference, or your dream wedding, we are a great venue with 14 meeting rooms and more than 24,000 square feet of function space. Our Grand Ballroom offers room for 1,200 people to toast, to cheer, and share your special day. Plan a massage to help banish any pre-wedding stress.Enjoy all the comforts of home and so much more at the Sheraton Sand Key Resort, an award-winning Mediterranean-style resort.